Growing up, I loved Creamola Foam. We went to visit my gran on Friday evenings and the first thing we'd do was check what flavour she had in stock each week. A minimum of one was a requirement, two was a luxury! In the early days I remember only lemon and raspberry, but orange became a favourite once we discovered it. I never really took to the 'cola' variety though. The last evidence I have for its existence is a photo from a 1990 camping trip with my ex husband, and two of my uni friends. 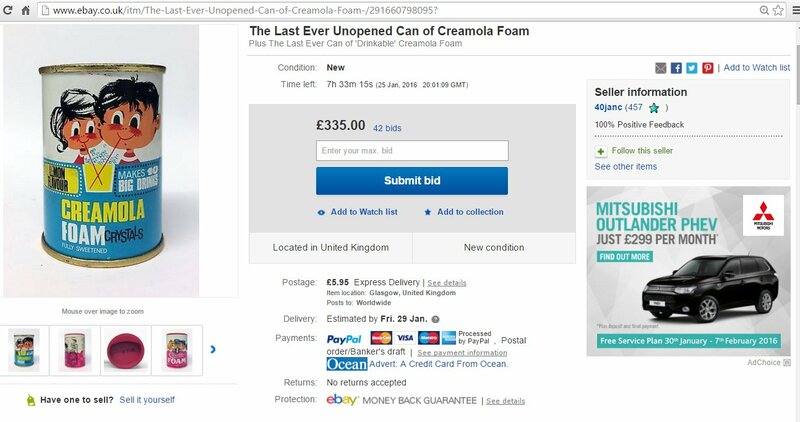 It made me smile when I came across this ebay entry the other day. I wish I'd stocked up back then!